There's not much to say about spinning this week, except that I am enjoying these Eaden Yarns rolags and I'm finding that working from fibre prepared in this way is easier as it is so much more portable. This was mostly done while in the garden with Archie, who can't go 'out' until next weekend. I had plans to do a lot more spinning during the last week, but other inspirations struck and I ended up crocheting a dog bed (come back on Friday to see it) and knitting a slightly whimsical cowl - I'll be showing my progress on that tomorrow. I find rolags draft much more smoothly for me than regular commercial top, too. Pretty colors! Gorgeous colours. I look forward to seeing everything else you've been working on! I have been very tempted by the gorgeous rolags from Eaden Yarns too! 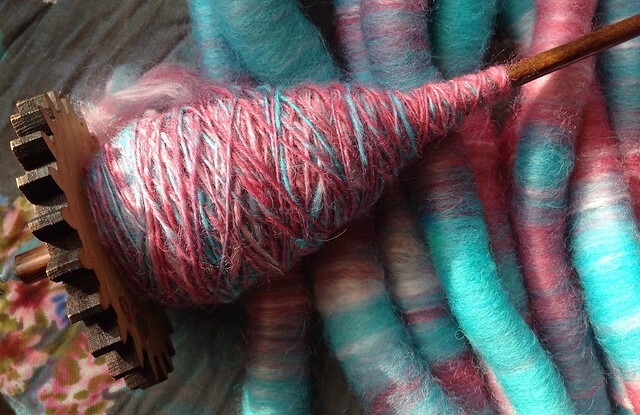 They are spinning up so beautifully on that gorgeous spindle!